This example demonstrates how to adjust the sensitivity of the motion detection in C#. To implement this example, you need to have OZEKI Camera SDK installed, and a reference to OzekiSDK.dll should be added to your Visual Studio project. How to set motion detection sensitivity using C#? To establish the connection properly between your application and an IP camera you should apply the same code snippet what you have used in the example (How to connect to an IP camera device using C#?). Important: you should study this article in order to find out how to setup your Windows Forms/WPF Application correctly. It's also recommended to visit the How to setup viewer side motion detection article before you begin to study and use this functionality. this method belongs to the "Pixel intensity" trackbar that can be seen on the graphical user interface. It is a new component as well and the method has been implemented in order to react properly to the scroll events of the new trackbar. It can be used to give the new value of the camera's "PixelIntensitySensitivity" property. The minimum value for the position of the trackbar's slider is 0 and the maximum value is 255. The lower the value the more sensitive the motion detector will be because it will react to a lower amount of pixel colour changes. this method belongs to the "Pixel amount" trackbar that can be seen on the graphical user interface that is a new component as well and the method has been implemented in order to react properly to the scroll events of the new trackbar. It can be used to give the new value of the camera's "PixelAmountSensitivity" property. The minimum value for the position of the trackbar's slider is 0 and the maximum value is 10. The "PixelAmountSensitivy" property's value can fall between 0 and 1 (because 0 is equal to 0% and 1 is equal to 100%), so we have to divide the trackbar's value by 100. The lower the value the more sensitive the motion detector will be because it will react to a lower number of pixel changes as well. After the successful implementation of the functions and the GUI elements, the application will work properly. 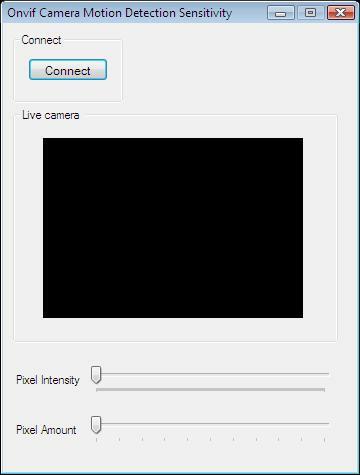 Pressing the connect button will load in the image of the IP camera device connected to your PC into the panel that you can see on the picture. Beside this you can set detection sensitivity for the camera with the two trackbars. After the successful implementation of the functions and the GUI elements, the application will work properly. Pressing the connect button will load in the image of the IP camera device connected to your PC into the panel that you can see on the picture. Beside this you can set detection sensitivity fo the camera with the two trackbars. Below you can find the code that belongs to the interface of the previously presented application. With the help of this section yor WPF Application will be able to work properly.